This was our first illusion design. It was based on a mathematical design we have often used before. Illusion knitting stripes are closer to garter stitch than they are to stocking stitch. Garter stitch ridges and stitches form a square grid and, in our experience, a design on a square grid works much better for illusion knitting than a normal stocking stitch (intarsia) grid. 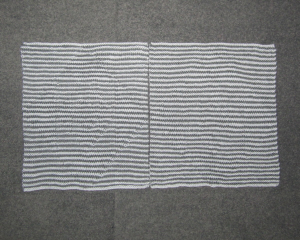 In illusion knitting, the stripes are in two colours and each stripe is made up of two rows. The right side of every stripe is knit, whichever colour is being used. You can completely forget about the right side rows as they are always plain knit. 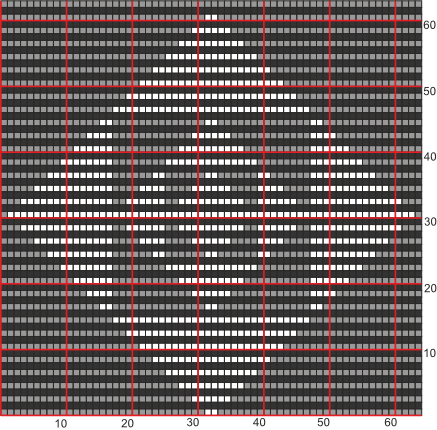 All the action takes place on the second row of the stripe (which is the wrong side of the work). You only need a chart for the wrong side rows. On the chart, white stitches are purl, coloured stitches are knit, using the colour for the stripe you are working. These two squares look alike when viewed from directly in front. 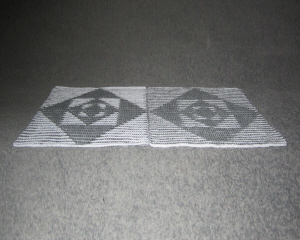 When they are seen from a angle one seems to be on a light-grey background the other seems to be on mid-grey. Both use the same two yarns. 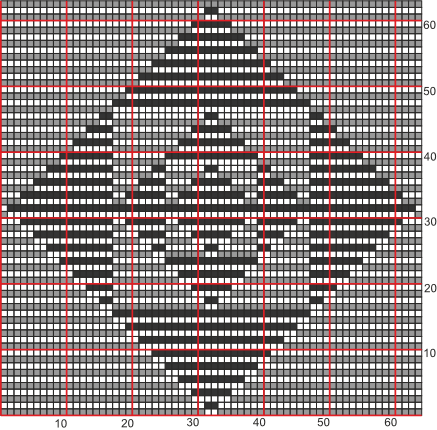 The chart on the left is for the version with the light-grey background. The chart below is for the mid-grey version.